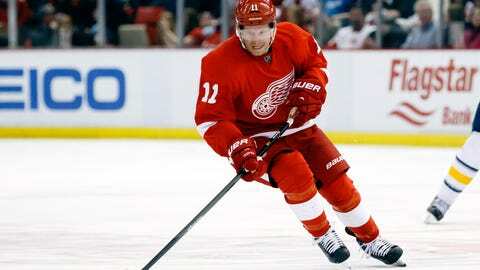 After missing the last two games with a sore back, Daniel Alfredsson is likely to return to Detroit's lineup for Game 5. DETROIT — One Red Wings regular appears to be ready to return, but another remains out. Daniel Alfredsson returned to practice Friday after missing the last two games with a sore back, while goaltender Jimmy Howard did not practice after missing Thursday’s Game 4 with the flu. "Gus (Jonas Gustavsson) is going to start," Wings coach Mike Babcock . "(Howard) wasn’t able to practice (Friday), I assume he’ll be the backup." Gustavsson, who found out right after warmups Thursday that Howard could not go, hadn’t been told yet that he was starting Game 5 in Boston after making his NHL playoff debut Thursday. Gustavsson said he and the team are just thinking about Game 5, not about trying to come back from a 3-1 series deficit to the Boston Bruins. In the last 31 playoff games since the start of 2011, Franzen has seven goals, four assists and is a minus-9. "It’s a new day and you’ve just got to turn the page and get ready for a game (Saturday)," Gustavsson said. "That’s all that’s in our heads right now is the game (Saturday) and try to get a win there." Captain Henrik Zetterberg, who returned to the lineup after missing more than two months following back surgery, said he expected to play in Game 5 despite not participating in the short practice Friday. "I’m feeling good," Zetterberg said. "It was fun to be out there (Thursday), play a game finally. I think back-wise I felt good (Friday). I’m looking forward to (Saturday)." Pavel Datsyuk also did not practice Friday but is expected to play. Whether there are other lineup changes remains to be seen. "We didn’t have Pav and Z on the ice so that gave me an opportunity to have everybody on the ice and not make any decisions and continue to break our game down," Babcock said. "I’ll sleep on it and I told our guys I’ll post the lineup (Saturday morning)." Babcock mentioned after Game 4 that the young Wings were having trouble in the face-off circle. In Game 1, a 1-0 Wings win in Boston, everyone did well. Datsyuk won 9-of-17, Darren Helm won 3-of-4, Riley Sheahan won 4-of-8 and Luke Glendening won 7-of-12. Since then, it’s been more problematic for Sheahan and Glendening, who are appearing in their first NHL playoffs. In Game 2, Datsyuk won 13-of-25, Helm won 5-of-13, Sheahan won 6-of-14 and Glendening won 1-of-7. In Game 3, Datsyuk won 13-of-20, Helm won 6-of-10, Sheahan won 2-of-11 and Glendening won 3-of-11. In Game 4, Datsyuk won 11-of-18, Helm won 8-of-13, Sheahan won 7-of-16 and Glendening won 1-of-9. "Obviously winning draws, you get possession of the puck so they’re big for us and they’re something that we definitely have to do better," Sheahan said. "We just gotta kind of match their intensity and kind of strategize off of what they do." I think I’m the weak link here. I’ve struggled in the faceoff circle and that’s hurt our team. Glendening admitted it was getting frustrating. "I haven’t been very good," Glendening said. "I’ve got to be better. I don’t have an answer. If I did I wouldn’t be as bad as I was." Glendening seemed to be taking the majority of the blame. "I think everyone else is doing well on our team," Glendening said. "I think I’m the weak link here. I’ve struggled in the faceoff circle and that’s hurt our team." It certainly doesn’t help Glendening that he is often matched up against Boston’s Patrice Bergeron, a 10-year NHL veteran who led the league with 1,015 face-off wins during the regular season. "The problem against Boston is they’ve got some good face-off guys," Babcock said. "If you’re Glendening, the coach is the guy who keeps putting you out there against Bergeron. He’s one of the best players in the world. If Pavel goes head to head with him it’s 50-50. So I don’t know if that’s a big surprise. In saying all that, though, why would you play him against him? Well, what’s my other option? "Glennie’s mentally tough. He’ll dig in and find a way. We’re hoping it’s sooner than later. We’re hoping it’s not three years from now. The same with Riley Sheahan. They gotta figure out a way to have the puck instead of chasing it. It’s a lot of D-zone time when you’re chasing it. You saw two power play goals last night. I think one took four seconds and the other one took four and half seconds or something. That means you lost the face-off. Faceoffs are a big deal in the game. They add up." Niklas Kronwall became a father for the first time Thursday morning. His son, Douglas, was born at 11:31 a.m.
Kronwall played in Game 4 and scored the first goal of the game, a power play goal at 11:00 of the first period. He also assisted on Pavel Datsyuk’s goal. Datsyuk became a father again when his daughter, Vasilisa, was born Wednesday. After the Wings lost in overtime, Kronwall returned to the hospital. "It was pretty cool," Kronwall said. "Tough to describe. I think only people with kids would kind of understand the feeling. I have a tremendous amount of respect for all mothers out there. To see up close what they go through, hat’s off." Kronwall said it was amazing to be there for the birth. "At first I was just hoping he was going to be OK, that he was healthy," Kronwall said. "Katinka did great, Douglas is doing really well. Just the first time, I really don’t know how to put it in words. It’s the biggest thing I’ve ever been through. Yesterday is the day that forever will be the best day of my life. It would have been even better of course with a win against Boston. But just going through something like that during the day was just amazing." 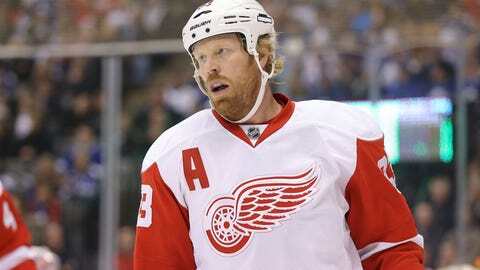 Alfredsson, who has four children, said he understands the feeling Kronwall and Datsyuk have right now. "Him and Pavel, it’s awesome," Alfredsson said. "I’m so happy for them. Everything’s gone well as well. It’s the proudest moment you can have as a human. It’s hard to describe until you go through it yourself. You can say, it’s so cool, but until you do it yourself, you don’t really understand. I thought it would be an unbelievable day yesterday if we could have gone on to win that game, it would have been some great headlines. But they were both extremely happy. It’s good to see."